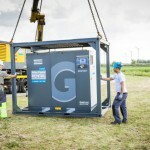 Atlas Copco general manager Matthew Hobden demonstrates the latest model G160 pneumatic compressor, noted for its high reliability and low operating costs. Atlas Copco has converted a large warehouse to carry out major overhaul work that’s not always possible on site at its new Western Australian headquarters in Perth. The warehouse conversion in Kewdale has created space for workshop and training, while being home to Atlas Copco’s Perth-based field service fleet. General manager Matthew Hobden said the company’s substantial investment underlined its commitment to bring new standards of service to its customers in mining, oil and gas, manufacturing and general engineering. “Having a large and comprehensively equipped workshop here in Perth will enable us to take on jobs that are too large or complex to handle on site, although our main service thrust will continue to be our field service teams,” Hobden said. The company’s primary aim was to optimise companies’ equipment uptime, delivered through innovative service concepts like remote monitoring of equipment. “While service standards will always be a key priority for us, we also recognise that energy savings are now a major priority for all our clients, whatever industry they are operating in,” Hobden added. “This is reflected in the performance characteristics of every new piece of equipment we introduce. It’s a key focus at Atlas Copco to design new or improved products that provide tangible benefits in terms of productivity, energy efficiency and/or lower life cycle cost for the customer. An example of this in action is the latest generation GA VSD+ variable speed drive compressors. The latest generation compressors produce an average of energy savings of 50 per cent compared to fixed speed alternatives. “Since 70 to 80 per cent of a compressor’s lifecycle cost comes from the energy consumption, this is key for the total cost of ownership,” Hobden said. Atlas Copco pioneered the variable-speed drive technology for compressors, which automatically adjusts motor speed to air demand. 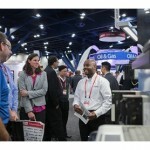 The company is also an established leader in the field of vacuum solutions, nitrogen and oxygen generators and blowers.